Most simply stated, acupuncture is the stimulation of certain points on the body to achieve a healing affect by altering biochemistry and physiology. It is a means for the body to heal itself. Acupuncture is very old medicine; it has been used successfully for 4000 years by many cultures. As a matter of fact, it is still the treatment of choice for one quarter of the world’s population. Chinese philosophy believes that disease is an imbalance of energy called Qi (pronounced chee). Acupuncture treatments restore the natural balance in the body and the animal heals itself. Acupuncture can be used by itself or in conjunction with western medicine. An acupuncture point is an area of free nerve endings, mast cells, blood and lymphatic vessels. Stimulation of these points induces release of neurotransmitters and neurohormones. Basically the central nervous system affects the musclo-skeletal, endocrine and cardiovascular systems. How it works depends on what disease is being treated and what points are being used. Endorphins are released which relieve pain, relieves muscle spasms, stimulates nerves, stimulates the immune system, and reduces inflammation and several other beneficial effects. Most disease processes can be treated with acupuncture. 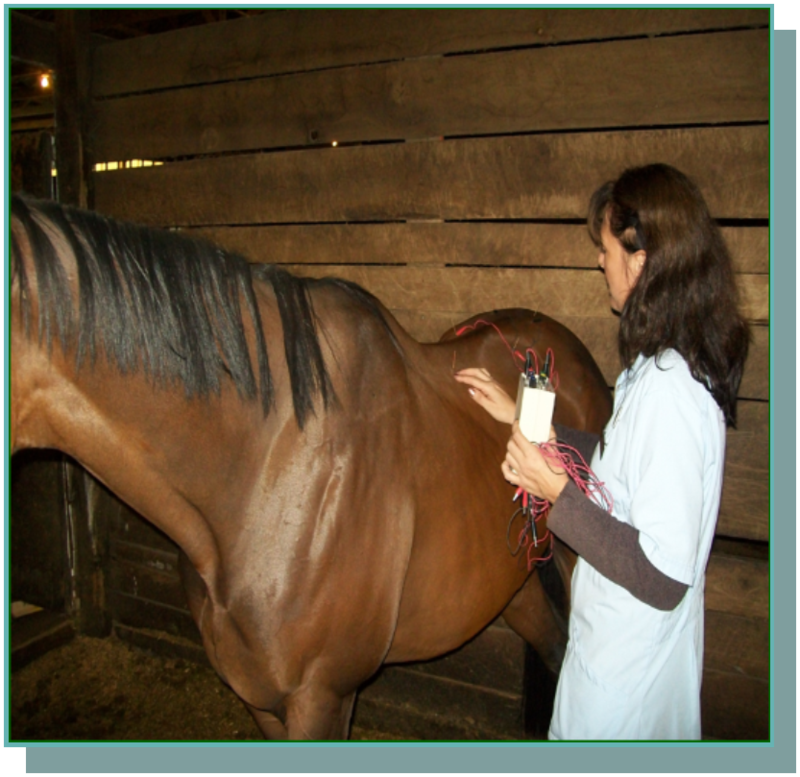 Musculoskeletal problems such as hip dysplasia, arthritis, disc disease, muscle soreness, laminitis, navicular disease. Alleviating nausea and anorexia for chemotherapy patients. What conditions should not be treated? Pregnant animals should not be treated. Abortion or breach birth is possible. Open wounds, infectious disease or fractures must be handled carefully. The acupuncture needles are very thin and small. It is virtually painless. The larger needles for large animals may cause some pain as the needle passes through the skin. In all animals, once the needles are in place, there should be no pain. Most animals relax and may sleep. People occasionally report a heavy sensation or a tingling sensation and may be uncomfortable. Acupuncture is one of the safest forms of medical treatment in the hands of a qualified acupuncturist. Side effects are rare. Occasionally an animal’s condition will get worse temporarily before it gets better. Some geriatric patients may sleep heavily after treatment. These effects are an indication of physiological changes and are most often followed by improvement. How many treatments and how long do they take? The length and frequency of treatments depends on the condition being treated and the method of acupuncture. Several different methods of point stimulation may be used, such as dry needle, electro-stimulation, aqua puncture, laser or moxa. A simple acute problem such as a sprain may only take one treatment. Chronic conditions may require several or several dozen treatments. When multiple treatments are necessary, they usually begin intensively and are tapered to maximum efficiency. Patients often start with 1-3 treatments a week. A positive response is often seen after 1-3 treatments. Once a maximum positive response is achieved (usually after 4-8 treatments), treatments are tapered off so that the greatest amount of symptom free time elapses between them. Many animals with chronic conditions can taper off to 2-4 treatments per year. How should I choose an acupuncturist? Your veterinary acupuncturist must be a licensed veterinarian. 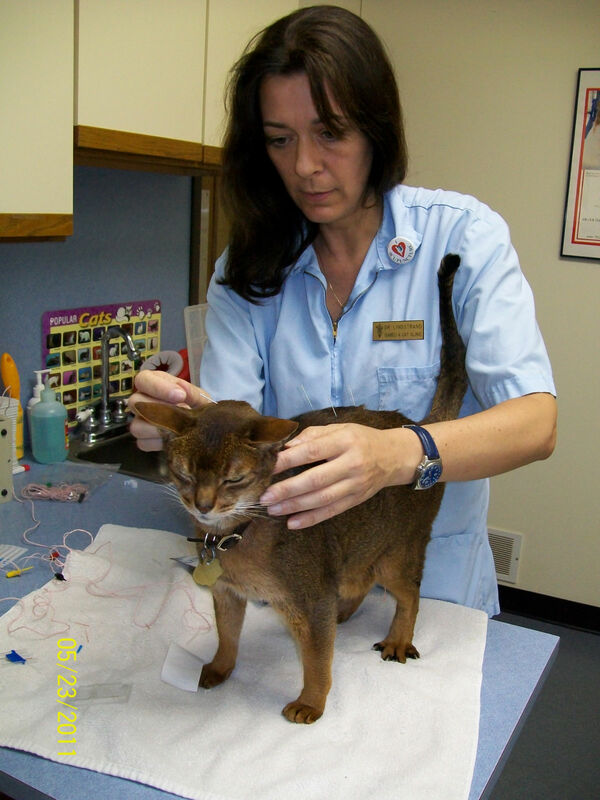 In most countries and states, veterinary acupuncture is considered a surgical procedure that only licensed veterinarians may legally administer to animals. A veterinarian is in the best position to determine if your animal would benefit from acupuncture, chemical, surgical or no intervention. 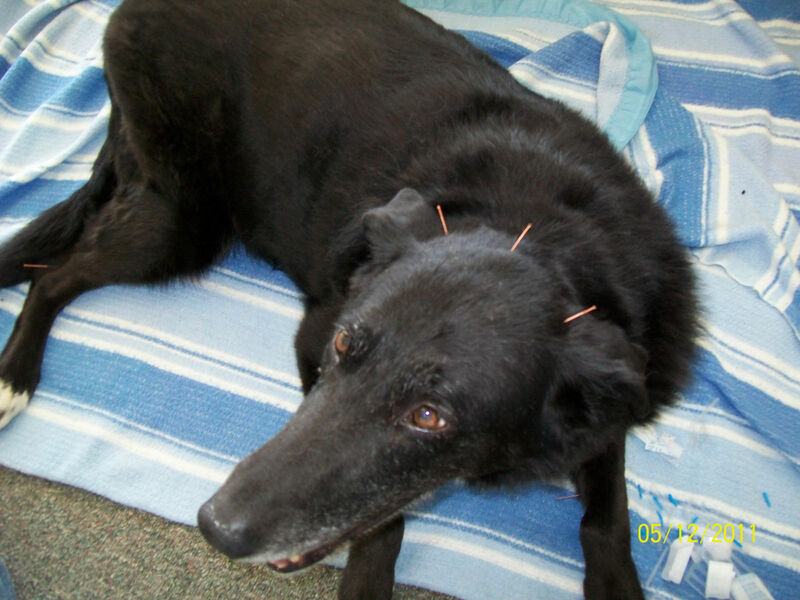 Your veterinary acupuncturist should have formal training in the practice of acupuncture for animals. (For example, the International Veterinary Acupuncture Society is the only accredited certification program for veterinary acupuncturists.) In the US, the American Veterinary Medical Association considers veterinary acupuncture a valid modality within the practice of veterinary medicine and surgery, but extensive educational programs should be undertaken before a veterinarian is considered competent to practice acupuncture. Dr. Catherine Lindstrand received her certification through the International Veterinary Acupuncture Society (IVAS) in 2006. She is a member of IVAS and the American Veterinary Acupuncture Association (AVAA). She treats primarily dogs, cats and horses, but has treated the occasional rabbit, llama, goat and guinea pig. Small animals are brought to her and she runs farm calls to the larger animals. She also uses herbal medicine to assist the acupuncture treatments. Hours of service Mon-Fri 9-5pm. Some evening hours available by appointment.